THINK TANK | Does ISIS Pose a WMD Threat? Home / Iraq / Islamic State / Syria / The Middle East / Think Tank / THINK TANK | Does ISIS Pose a WMD Threat? EXECUTIVE SUMMARY: The risk of ISIS employing chemical, biological, and radiological warfare agents is real. In fact, ISIS already has attacked with chemical agents. ISIS has mobilized Iraqi and Syrian scientists who are assisting in the development of chemical weapons, particularly nerve and mustard gas, alongside foreign experts. It also has reportedly moved its labs, experts, and materials from Iraq to Syria. Since its emergence, ISIS has sought chemical weapons and has used them against its opponents, namely the Syrian opposition groups, Kurds, Iraqi and Syrian government forces. In September 2014, around 40 Iraqi soldiers and Shia militiamen showed symptoms of chlorine poisoning and many were hospitalized, consequent to the use in battle of bombs with chlorine-filled cylinders. Around the same time, ISIS insurgents surrounded hundreds of Iraqi soldiers in the Saqlawiyah district of northern Fallujah, and used chlorine gas to suffocate them before detonating a car bomb. This resulted in the death of 300 Iraqi soldiers. In January 2015, weaponized chlorine gas was likely employed by ISIS in a suicide bombing in northern Iraq against Kurdish Peshmerga fighters. Iraqi officials showed the BBC videos in March 2015 that they say confirm Islamic State use of chlorine gas in crude home-made bombs. Three months later, ISIS shelled several security checkpoints and residential areas in Ramadi with chlorine gas-imbued bombs. This past August, ISIS launched 45 120mm-mortar shells tipped with mustard warheads against the Kurds in Makhmour, Iraq, and the effects included burns, blisters, severe damage to the eyes, respiratory system, and internal organs. Since July of last year, ISIS has repeatedly attacked Kurds with chemical weapons in the strategic Syrian city of Kobane. At first, the ISIS used chlorine in Kobane and later, by this August, mortar shells filled with mustard gas. During an attack in Hasakah in August 2015, the same mustard weapons were used. The same weapon was used shortly thereafter by the group while fighting in the town of Mare near Alleppo. In contrast to chlorine, which ISIS succeeded in weaponizing, mustard agent in a powdery form is regularly used too, which is a sophisticated albeit old weapon that probably originated in the Iraqi army. This may be the outcome of the June 2014 capture by ISIS of the huge Muthanna State Establishment, the main Iraqi chemical weapons facility dating back to the regime of former Iraqi president Saddam Hussein. Although the facility was heavily bombarded in 2003, it still contains two bunkers containing chemical weapons. Iraqi Ambassador Mohamed Ali Alhakim, in a letter to U.N. Secretary-General Ban Ki-moon in July 2014, said: "The Government of Iraq requests the States Members of the United Nations to understand the current inability of Iraq, owing to the deterioration of the security situation, to fulfill its obligations to destroy chemical weapons." Around the same time, ISIS captured approximately 40kg of uranium compounds at Mosul University. The uranium – a weak radioactive material – was not enriched. Remarkably, ISIS had already set up – possibly in Mosul University – a branch dedicated to research and experiments of chemical weapons. ISIS had also mobilized Iraqi and Syrian scientists who are currently assisting the development of chemical weapons, particularly nerve and mustard gas. Foreign experts came from Chechnya and Southeast Asia as well. Recently, ISIS reportedly moved its labs, experts, and materials from Iraq to "secured locations" inside Syria. It is highly likely that ISIS seeks chemical, biological, and radiological materials for both military and civilian targets, such as subways, food, and water supplies. ISIS is an even more brutal and radical group than al-Qaida, which has also pursued WMD. 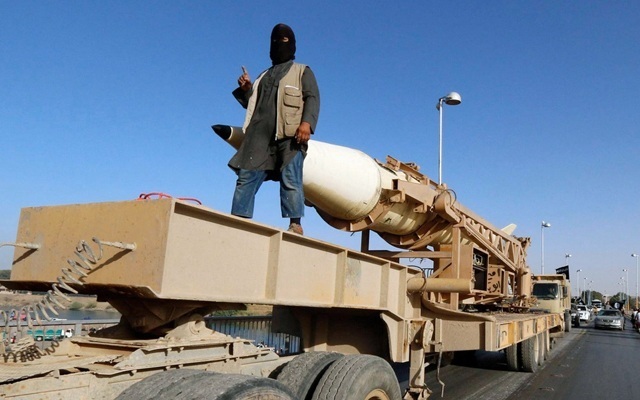 Given the technological limitations that ISIS faces, their procuring of a nuclear device is highly unlikely. However, the probability that the group will acquire further chemical agents, and seek to obtain biological and radiological agents for the first time – not necessarily weaponized – is high. ISIS could seek these weapons in order to compensate for its military inferiority as well as for retaliating against what ISIS regards as foreign interventions. An attack could occur anywhere across the globe. ISIS does not display any degree of morality whatsoever and does not fear the consequences of its deeds. Carrying out an attack with chemical, biological, or radiological weapons is not easy, given the pressure now put on ISIS. In practical terms, various factors have to be taken into account. Technologically, ISIS has a limited capability of producing such weapons, but could hire outside experts or force experts to cooperate. It could also utilize various existing production facilities, laboratories, hospitals, and universities to create a crude weapon. ISIS is apparently incapable of safely handling highly dangerous toxicants, pathogens, and radioisotopes, but this should not constitute a bottleneck within a radical organization like ISIS. Some factories in ISIS controlled areas may contain highly poisonous pesticides, particularly organophosphorus compounds. Universities and certain civilian medical and pharmaceutical facilities may contain hazardous biological materials such as anthrax or cholera germs that were meant to be used for scientific research or vaccine production. Clinics for cancer treatment or blood irradiation typically use cesium 137 or cobalt 60, which can be utilized as radiological agents and are long-lived – about 30 and 5 years respectively. While these can be employed for regional radiological terrorism, smuggling radioactive materials across border checkpoints would probably be detected. In terms of potential aerial delivery systems, ISIS could capture and use agricultural spraying airplanes or unmanned aerial vehicles. ISIS could also infect individuals with pathogens found in civilian facilities, and let them roam freely among the public and across borders as rudimentary dispersal devices. Whether or not more residual state-owned chemical weapons in an operational condition are available for ISIS in Iraq and Syria, it appears that the group endeavors to expand its own capabilities. In short, the current chaotic circumstances in the region are conducive to its efforts. Only an incapacitating blow against the group will remove this threat. The disruptive processes generated by the Arab uprisings could still bring about some unpredictable danger or crisis. While ISIS is one outcome of these upheavals, its extreme and aggressive nature indicates that it would not hesitate to use any means to achieve its goals. The risk of chemical, biological, and radiological warfare and terrorism are tangible threats that must be dealt with now. The warning recently delivered by French Prime Minister Manuel Valls concerning the possible employment of chemical or biological agents by ISIS in Europe is noteworthy. Across the Middle East, the chemical menace of ISIS is already evident, and may well increase. Lt. Col. (res.) Dr. Dany Shoham, a microbiologist, is a senior research associate at the Begin-Sadat Center for Strategic Studies. Recognized as a top expert on chemical and biological warfare in the Middle East, he is a former senior intelligence analyst in the Israel Defense Forces and the Israeli Defense Ministry.